We continue to beef up the team with ongoing hires: Careers at Cytonn. During the week, T-bills were undersubscribed, with the overall subscription rate coming in at 46.7%, compared to 42.7% recorded the previous week, due to relatively tight liquidity in the money market; the tight liquidity was due to heavy reverse repo maturities and transfer from banks - taxes that came in at Kshs 19.9 bn and Kshs 17.4 bn, respectively. The subscription rates for the 91, 182 and 364-day papers came in at 41.8%, 45.9%, and 49.5% compared to 63.4%, 43.6% and 33.7%, respectively, the previous week. Yields on the 91, 182 and 364-day papers remained unchanged at 8.1%, 10.3% and 11.0%, respectively. The overall acceptance rate came in at 97.6%, compared to 95.5% the previous week, with the government accepting a total of Kshs 10.9 bn of the Kshs 11.2 bn worth of bids received, against the Kshs 24.0 bn on offer in this auction. Despite this, the government is still behind its domestic borrowing target for the current fiscal year, having borrowed Kshs 68.5 bn, against a target of Kshs 126.2 bn (assuming a pro-rated borrowing target throughout the financial year of Kshs 410.2 bn budgeted for the full financial year as per the Cabinet-approved 2017 Budget Review and Outlook Paper (BROP)). Liquidity in the money market remained relatively tight during the week despite a net liquidity injection of Kshs 12.0 bn, compared to a net injection of Kshs 0.3 bn the previous week. A significant amount of the liquidity injection came from Reverse Repo Purchases of Kshs 17.9 bn as the CBK looked to counter the high liquidity reductions brought about by Reverse Repo Maturities and Transfer from Banks - Taxes, of Kshs 19.9 bn and Kshs 17.4 bn, respectively. The average interbank rate declined to 6.8% from 8.0% recorded the previous week, with the average volumes traded in the interbank market decreasing by 14.9% to Kshs 26.1 bn from Kshs 30.7 bn the previous week. Of note is that this week, the banks’ holding of excess liquidity was below the 5.25% requirement by Kshs 1.5 bn. For the month of October, the government issued a new 5-year bond (FXD 2/2017/5), in a bid to raise Kshs 30.0 bn for budgetary support. The overall subscription rate for the bond issue came in at 66.9%, with the market average bid rate coming in at 12.6%, slightly above the accepted rate of 12.5%. Just as was the case with other previous bond auctions for this fiscal year, in which the government only accepted 57.8% of total bids on average, the government did not accept expensive bids, accepting only Kshs 13.5 bn out of the Kshs 20.1 bn worth of bids received, translating to an acceptance rate of 67.3%. We expect the government to continue rejecting expensive bids on government securities while maintaining interest rates low to prevent further crowding out of the private sector by banks as they channel more funds towards government securities. However, pressure could mount on the government, given (i) the tight liquidity levels currently being experienced in the market, due to heavy reverse repo maturities and transfer from banks – taxes, (ii) the government being behind its domestic borrowing target, and (iii) the expected low revenue collections by the Kenya Revenue Authority (KRA). According to Bloomberg, yields on the 5-year and 10-year Eurobonds declined by 20 bps and 10 bps during the week to close at 3.8% and 6.2%, from 4.0% and 6.3%, the previous week, respectively, which is rather surprising given the increased political tension in the country as a result of the fresh presidential election this coming week. Yields on these two bonds have been on a downward trend since July, and this can be attributed to the stability that has prevailed during the Kenyan General Election period. Since the mid-January 2016 peak, yields on the Kenya Eurobonds have declined by 5.0% points and 3.5% points for the 5-year and 10-year Eurobonds, respectively, due to stable macroeconomic conditions in the country. The declining Eurobond yields and stable rating by Standard & Poor (S&P), in spite of the political uncertainty around the presidential poll re-run are indications that Kenya’s macro-economic environment remains stable and hence an attractive investment destination. However, concerns from Moody’s around Kenya’s rising debt to GDP levels may see Kenya receive a downgraded sovereign credit rating. The Kenya Shilling depreciated against the US Dollar during the week to close at Kshs 103.6, from Kshs 103.3 recorded the previous week, due to heightened importer dollar demand brought about by the increased political uncertainty, prior to the fresh poll this coming week. On a year to date basis, the shilling has depreciated against the dollar by 1.1%. In our view, the shilling should remain relatively stable against the dollar in the short term, supported by (i) the weakening of the USD in the global markets, (ii) increased diaspora remittances that grew by 5.3% to USD 1.0 bn in 7 months to July 2017 from USD 987.2 mn in a similar period last year, and (iii) the CBK’s activity, as they have sufficient forex reserves, currently at USD 7.4 bn (equivalent to 4.9 months of import cover). The key factor to watch is the current account deficit that worsened to 6.2% of GDP in Q2’2017, as compared to 5.3% of GDP in a similar period last year. Rates in the fixed income market have remained stable, and we expect this to continue in the short-term. However, a budget deficit that is likely to result from depressed revenue collection creates uncertainty in the interest rates environment as any additional borrowing in the domestic market to plug the deficit could lead to upward pressures on interest rates. Our view is that investors should be biased towards short-to medium term fixed income instruments to reduce duration risk. During the week, the equities market was on a downward trend with NASI, NSE 20 and NSE 25 losing 2.7%, 2.3% and 1.8%, respectively, taking their YTD performance to 16.2%, 14.7% and 11.2% for NASI, NSE 25 and NSE 20, respectively. This week’s performance was attributable to losses by select large cap stocks such as BAT Kenya, Barclays and Safaricom, which lost 7.1%, 5.3% and 4.0%, respectively. 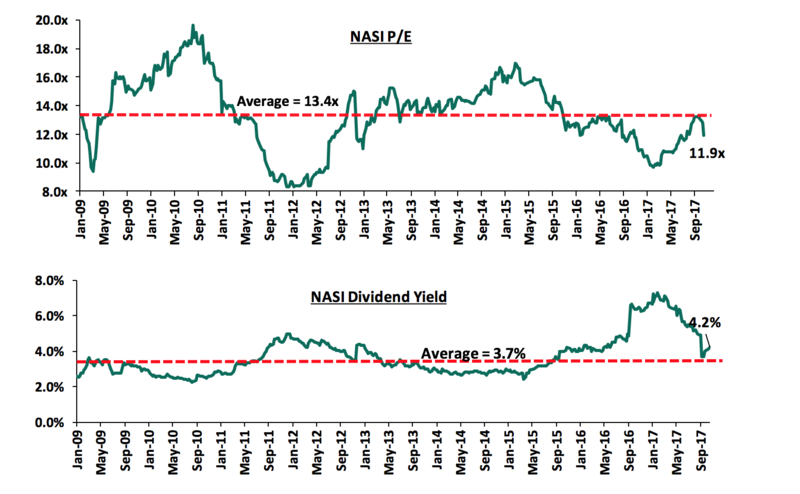 Since the February 2015 peak, the market has lost 12.7% and 35.6% for NASI and NSE 20, respectively. Equities turnover decreased by 24.6% to USD 19.1 mn from USD 25.4 mn the previous week. Foreign investors were net sellers with a net outflow of USD 0.7 mn compared to a net outflow of USD 0.3 mn recorded the previous week. We expect the market to record subdued activity over the coming few weeks as market players remain cautious of the renewed political uncertainty in the country. Despite this, we expect the market to remain supported by improved investor sentiment once the country takes to the polls for the presidential elections scheduled for October 26th. The market is currently trading at a price to earnings ratio (P/E) of 11.9x, versus a historical average of 13.4x, and a dividend yield of 4.2%, compared to a historical average of 3.7%. Despite the valuations nearing the historical average, we believe there still exist pockets of value in the market, with the current P/E valuation being 29.6% below the most recent peak in February 2015. The current P/E valuation of 11.9x is 22.9% above the most recent trough valuation of 9.7x experienced in the first week of February 2017, and 43.4% above the previous trough valuation of 8.3x experienced in December 2011. The charts below indicate the historical P/E and dividend yields of the market. The Central Bank of Kenya (CBK) and the Kenya Deposit Insurance Corporation (KDIC) have shortlisted three potential investors of Imperial Bank Limited (IBL) from a list of undisclosed investors who expressed interest in the bank at the start of a process concluding at the sale of a significant stake in IBL in June 2018. The CBK and KDIC are at advanced stages with a similar process for Chase Bank and recently received a non-binding offer from SBM Holdings with respect to Chase Bank. The interest in both banks, which have been under receivership, by both local and foreign financial services sector players is an indication that the Kenyan banking sector remains attractive as it offers access to high returns with the return on equity being among the highest in the world, with listed banks having recorded return on equity of 18.1% in H1’2017. Old Mutual Plc (listed on the London Stock Exchange) has written off Kshs 9.7 bn as goodwill impairment from the value of its local subsidiaries, attributed to (i) slower than expected integration of UAP Holdings with other local financial services firms to create UAP-Old Mutual, and (ii) adoption of a new goodwill valuation methodology at the group level in accordance with accounting requirements. Old Mutual acquired a 60.7% stake in UAP in January 2015 for Kshs 20.8 bn, translating to a price to book (P/B) multiple of 3.6x. Following the adjustment of the goodwill impairment, the post write-off acquisition transaction value drops to Kshs 11.1 bn representing a P/B transaction multiple of 1.9x. The post write-off 1.9x P/B valuation represents a transaction multiple that is close to the median and harmonic mean multiples of past transactions, which are 1.9x and 2.2x, respectively as summarised in the table below. This could mean that Old Mutual overpaid for the UAP acquisition. Vodafone Group, a British multinational telecommunications company, has indirectly sold 90.0 mn shares in Safaricom for Kshs 1,300 (South African rand 165) effectively raising Kshs 117.5 bn (South African rand 14.85 bn) through its Johannesburg-listed subsidiary Vodacom Group. In a previous transaction finalised on August 7, Vodafone Kenya, a fully owned subsidiary of Vodafone Group ceded 34.9% of its total 39.9% ownership of Safaricom to Vodacom Group in return for a 5.0% stake in Vodacom Group for an estimated Kshs 266.6 bn, increasing Vodafone Group’s (British) stake in Vodacom Group (South African) from 65.0% to 70.0%. The sale of shares is aimed at ensuring Vodacom meets the 20.0% minimum free float requirement on the Johannesburg Stock Exchange (JSE). Following the sale, Vodafone’s stake in Vodacom has reduced to 64.5% from 70.0%, just below its ownership prior the first transaction indicating that the share swap deal finalized on August 7, 2017 was to enable Vodafone access the liquidity, diversification and depth of JSE, which would not have been achieved in the Kenyan Nairobi Securities Exchange where Safaricom is listed. Vodafone will continue to hold a 5.0% interest in Safaricom, in addition to the indirect interest held through Vodacom Group. As highlighted in our Cytonn Weekly #20/2017, the deals expose Vodacom Group to the attractive high growth Kenyan market, which has made significant steps in technological innovation and give it greater access to M-PESA, hence promoting expansion of the M-PESA business in Africa, and consequently promoting growth of Safaricom, as M-PESA remains a key growth driver of the company. This translates to a win-win situation for all the parties - Vodafone Kenya, Vodacom group and Safaricom. In an effort to keep our rankings of companies on the Cytonn Corporate Governance Ranking (Cytonn CGR) Report up-to-date, we continually update the rankings whenever there are changes on any of the 24 metrics that we track, and how this affects the company ranking. From the last Annual General Meeting (AGM) held in April 2017, KCB Group announced the retirement of three board members from the board; Mrs Catherine Kola, Mrs Charity Muya – Ngaruiya, and Gen (Rtd) Joseph Kibwana, and appointment of Dr Nancy Asiko Onyango as a non-executive director. KCB Group’s score has maintained at 91.7%; the board size has reduced to an odd number 9 from an odd number 11, while gender diversity has declined to 22.2% from 27.3%. However, both changes do not warrant a change in score. KCB Group has therefore retained its top position. We remain "neutral with a bias to positive" for investors with short to medium-term investments horizon and are "positive" for investors with a long-term investment horizon. M-KOPA Solar, an off-grid solar provider with operations in Kenya, Uganda and Tanzania, has received USD 80.0 mn (Kshs 8.3 bn) funding in form of debt. The funding was contributed by 7 lenders including, (i) Stanbic Bank who committed USD 9.0 mn, (ii) CDC Group, the UK’s Development Finance Institution, who earlier this year backed the firm with USD 12.0 mn of equity, will also contribute USD 20.0 mn, (ii) FMO, the Dutch Development Bank and Norfund, Norway’s Development Finance Institution, who have committed USD 13.0 mn each, and an additional USD 25.0 mn from responsAbility, Symbiotics and Triodos Investment Management. The firm, which makes solar home systems affordable to low-income households on a pay-as-you-go installment plan, will utilize the funding to support ongoing expansion plans for the firm, targeting to install 1 million pay-as-you-go solar systems over the next three years. Investor interest in the renewable energy sector is mainly driven by projected demand for renewable energy, informed by the fact that (i) only 30% of the African population have access to power, and (ii) 315 mn rural citizens are expected to get access to electricity by 2040, with 70% of this population expected to get connected through off-grid systems such as solar power. The investment in M-KOPA also highlights foreign investor interest in Africa driven by expected strong economic projections in Sub Sahara Africa, which is expected to be better compared to global markets. Private equity investments in Africa remains robust as evidenced by the increased fundraising activity in sectors such as technology. The increasing investor interest is attributed to (i) rapid urbanization, a resilient and adapting middle class and increased consumerism, (ii) the attractive valuations in Sub Saharan Africa’s private markets compared to its public markets, (iii) the attractive valuations in Sub Saharan Africa’s markets compared to global markets, and (iv) better economic projections in Sub Sahara Africa compared to global markets. We remain bullish on PE as an asset class in Sub-Sahara Africa. Going forward, the increasing investor interest and stable macro-economic environment will continue to boost deal flow into African markets. Conference tourism (MICE), which is valued at Kshs 30.0 bn, with hotels accounting for 60.0% of this total value, according to the Kenya Hospitality Report, 2017 by Jumia Travel, and Kenya ranking as the second best destination for conference tourism in sub-Saharan Africa after South Africa by the International Congress and Convention Association (ICCA). In the retail sector, Naivas has announced plans to open an outlet store at Bank House located at the junction of Moi Avenue and Kenyatta Avenue within Nairobi’s Central Business District. The retailer seeks to tap into the uptown Nairobi market, which is currently served mainly by Tuskys and Nakumatt Supermarkets. Additionally, Naivas Supermarket also seeks to open other branches in Utawala, Mountain View along Waiyaki Way, Kitengela, Kericho and Mombasa while closing non-performing stores in Githunguri, Kiambu County and Ronald Ngala Street in Nairobi CBD. The retailer continues to expedite its expansion strategy despite the tough operating environment characterized by low bank credit accessibility and increased competition as it remains bullish on market performance informed by the increased demand due to growth in middle class income earners, translating to an increase in purchasing power. On the other hand, Woolworths, a South African luxury fashion brand, has closed its Thika Road Mall store outlet citing low sales attributed to low footfall in the mall, current positioning of the shopping mall complex out of its target market niche and cannibalism from the larger retailer’s store in Garden City Mall. However, the fashion brand has since opened additional stores in The Hub and Two Rivers Mall as it seeks to optimize its business operations. This is a clear indication that the retail space developers need to carry out comprehensive research on matters such as tenancy mix, market positioning of the malls and stability in key anchor tenants to attract the right retailers and clientele in order to maintain stability in mall performance. Tatu City, one of Kenya’s Vision 2030 flagship projects', is set to release an additional 435 acres of land for sale in its industrial park in the course of next year after selling its industrial plots at an annualized compounded growth rate of 37.5% from 2016 to date, and seen companies such as Bidco, Chandaria Industries and Unilever, among others, take up serviced plots in Tatu City industrial park for light industrial assembly, warehouse and logistic buildings. The project is a controlled master planned development in Ruiru, Kiambu County, sitting on a total of 5,000 acres with 18.3% of its current 2,500 acres in phase one of the project allocated to Industrial park development. Tatu City is strategically accessible via both Eastern and Northern bypasses making the industrial park provide convenience for light warehousing companies and thus pushing the demand for industrial plots in the area. Other factors supporting the uptake are: (i) the Government’s support through economic policies such as according Tatu City the Special Economic Zone status, (ii) increased demand for Grade A industrial parks, and (iii) the industrial parks performance, with Baba Dogo, Industrial Area and Syokimau experiencing annual rental yields of 6.3%, 5.8% and 7.6% compared to average rental yield of 5.2% and 6.0% for apartments and detached residential units, respectively, within Nairobi and its Metropolitan areas as per Cytonn’s Q3’2017 Market Review Report. Tatu City has not only recorded good performance in industrial sector alone but also in the residential sector and areas allocated for schools, recording an uptake of 60.0% in the current first phase of the project. This positive performance of the Tatu City project is set to positively impact the real estate sector and economy as a whole through creation of jobs, reducing the housing deficit and promoting the production and manufacturing sector as a result of improved industrial warehousing facilities in the country. China Wu Yi is set to complete the construction of its 75,970 SQM Industrial Research, Development, Production and Construction Material Supermarket in Athi River in March 2018. The development will comprise of an exhibition area, office block, service block, building material supermarket and a hotel. Athi River provides strategic location for the plant since: (i) its zoned for the industrial parks, (ii) its close proximity to Jomo Kenyatta International Airport, (iii) access to use of the Standard Gauge Railway, and (iv) access to Nairobi-Mombasa road, which is set to be converted into a dual carriage highway, and ease the firm’s operations while providing a central economic zone to serve East Africa’s building and construction market. According to Kenya National Bureau of Statistics’ Economic Survey 2017 report, new and completed buildings in Nairobi registered a growth of 7.6% from 2015 to 2016 while approved building plans in Nairobi increased by 43.3% over the same period. The increased trend in the building and construction sector is expected to provide market demand for the materials to be provided by a construction material supermarket. Notably, the plant is set to provide easier access to construction material for real estate developers and reduce the local cost of construction incurred by developers attributed to importation of construction materials. The construction cost savings should enhance the efficiency in real estate development in the country and therefore help towards meeting of the annual national housing deficit, which is approximately 250,000 units per annum. Nairobi City County Government has issued a pre-notice to encroachers living on land set aside for the scheduled city’s light rail projects to vacate. The Kshs 14.0 bn project funded by the World Bank will involve construction of nine railway corridors. The commuter trains network is expected to ease the daily traffic snarl ups experienced by Nairobi residents by reducing commute time thus, allocating more time to economically productive activities. We expect the real estate sector to remain vibrant with the tourism and retail sectors gaining more international focus supported by (i) a growing middle class, (ii) improved infrastructure, and (iii) a growing economy, with more effort by private developers and the government geared towards low cost housing for the low income segment of the population. Following Cytonn’s recent plans to list by introduction on the Nairobi Securities Exchange (NSE) after having converted to a public company, Cytonn Investment Management Plc, we got may inquiries about the listing. Consequently, we thought it best to educate the public on what it means to list a company on a securities exchange, talk about the different market segments available for companies to list on the NSE, and expound on the different types of listing. Listing a company involves making available to the investing public shares of a public company through placing the shares on an official stock exchange. Contrary to common perception, listing shares on an exchange does not always involve selling shares to raise capital but may be done for other reasons, which we discuss below. Selling shares to the public for the first time with the aim of raising capital is referred to as an Initial Public Offer (IPO), the amount being raised from the issue is known in advance and when no capital is being sought in the market it is referred to as a Listing by Introduction, which we will delve into as we conclude. Examples of companies that have listed by introduction in Kenya include Equity Group, Flame Tree Group Holdings Ltd and Deacons (East Africa) Plc, while Superior Homes (K) Ltd is also pursuing a listing by introduction. Make it easier for it to cross-list on other exchanges – once a company has already successfully listed on one stock exchange, it is perceived to have already been through scrutiny and due diligence procedures, and has gone through the whole listing process once, hence the process of listing on another exchange will be less tedious. Growth Enterprises Market Segment (GEMS): GEMS was introduced to provide a regulated platform whereby SMEs could gain access to cheaper capital market funds and benefit from the regulatory environment that comes with it, promoting corporate governance and transparency. Its requirements were made less stringent to accommodate the smaller growth companies, with requirements such as no minimum firm asset value and profitability record required, submission of audited accounts for just the year that precedes the year of listing, and a minimum of Kshs 10.0 mn in paid up share capital. Reverse listing: This is a rare kind of listing strategy whereby a company that is not listed on any exchange purchases a listed company and becomes automatically listed by virtue of this transaction. It is common when a company that wants to have access to the capital markets also wants to avoid the time and cost spent in a regular listing. Extensive regulation and scrutiny: some non-listed companies shy away from listing on the stock exchange due to the harsh regulatory environment, extensive scrutiny and due diligence process and the extent of transparency and corporate governance that has to be adhered to by listed companies. This mainly affects the smaller companies that are majorly family owned and governed. In terms of encouraging listing and access to the capital markets, regulators should (i) focus on making the process seem less tedious, (ii) working on reducing the costs incurred when listing, and (iii) educating companies on the importance of corporate governance. In conclusion, listing by way of introduction means that a firm is not planning to raise any capital initially by listing on an exchange. When listing on the exchange, existing shareholders do not have to sell their shares once listed. Once listed, the major shareholders are not allowed to sell their shares for 24 months after the listing date to ensure that the owners are aligned to the company’s long term strategy and hence do not dump their shares on other unsuspecting investors. Listing therefore works to the advantage of the company and its investors.